Home / Blog / We’re Having a Pre-Cut Party on Monday 3rd September & You’re Invited! We’re Having a Pre-Cut Party on Monday 3rd September & You’re Invited! 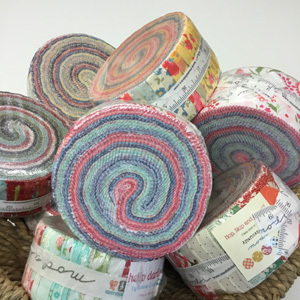 We’re having a Pre-Cut Party on Monday 3rd September with discounts off all pre-cuts including: Layer Cakes, Jelly Rolls, Dessert Rolls, Charm Packs & Mini Charms, as well as Jelly Roll Books & Moda’s Cake Mix & Cupcake Mix pads & Recipe Book ~ there’s four new Cake Mix Recipes 9, 10, 11 & 12. There’s a free pattern with every pre-cut purchased too (one per person). On our website from now until midnight on Monday, you can get 10% off these items with discount code PRE-CUT PARTY 2018. In Store on Monday 3rd September, there are further discounts: Buy one pre-cut & get 10% off, buy two & get 15% off, buy 3 or more & get 20% off. There’ll be samples on show, made from pre-cuts too.